One of the most stimulating things about participating in the Curious Travellers project has been the exposure of huge gaps in my general knowledge: on my walk past Henllys a few weeks ago I noted the curious shapes of the fields and banks by the road but was unable to interpret them due to my complete ignorance of the relevant branch of physical geography (if that’s the correct discipline). Now I’m wondering whether the odd bank on one side of the road to the farm could be something to do with the moat. I should stop speculating, and find out. Anyway, diolch yn fawr iawn i’r ddau Cledwyn – thanks to my neighbour and his friend the archivist, I can confirm that Maes y Bendithion (the Field of Blessings) does indeed exist, and is also known as “Erw’r Bendithion” (the Acre of Blessings). It is located at approximately SH913.696 on the modern Ordnance Survey map, just east of the farm at Henllys. 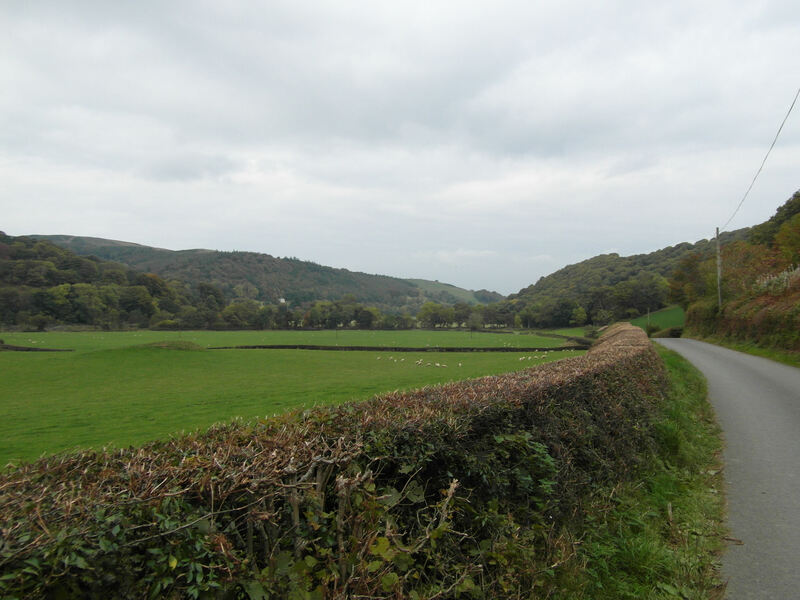 There are other named fields associated with Hedd Molwynog in the immediate area, and the oral tradition of Erw’r Bendithion still persists in the village. In addition to gathering fascinating information I am also collecting coincidences, and I find I have in fact already taken a photograph of the Acre of Blessings. During the walk mentioned above, I found a good place to take a photograph of the “most lovely view of a fertile little valley, bounded by hills covered with hanging woods” mentioned in connection with Garthewin, the seat of Robert Wynn on the opposite side of the river. The digital camera has flattened the image and has not done justice to the hanging woodland. However, it has taken quite a good shot of Erw’r Bendithion, lying in front of the line of trees in the middle distance. This entry was posted in Walkers' Blog on 7th November 2015 by Alex Deans.